Erin is using Smore newsletters to spread the word online. Rita Pierson, a teacher for 40 years, once heard a colleague say, "They don't pay me to like the kids." Her response: "Kids don't learn from people they don't like.'" A rousing call to educators to believe in their students and actually connect with them on a real, human, personal level. I can't thank you enough for all that you do for our kids! There are so many things that each of you do each day to make a difference in your students lives. I look forward to a week of celebrating all of you. Teaching is the hardest job in the world because it is the most important. What to look forward to this week! Breakfast from the school board! Wear Jeans with your nicest Brock Shirt! Let's look our best for our board! Chicken and Burgers from Admin with sides from Bakers Ribs! Mr.Hudson and I will send out a schedule that gives all teachers an hour for lunch this day. We will get that out tomorrow. Staff Meeting after school for STAAR- All staff for the first part of the meeting. Lunch from the Office in the lounge! We will provide pizza and salad from Pizza Place! 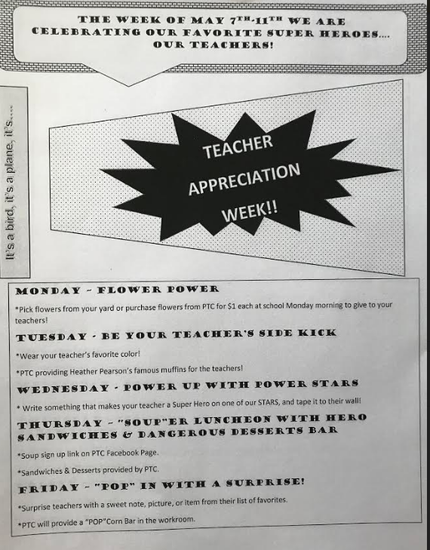 Treats and Surprises From our Awesome PTC!